This little guy popped his forelegs out of the hole in the pepper just before I cut into it. Note the web inside the pepper. Some water had pooled in the bottom, providing a complete ecosystem for the spider. 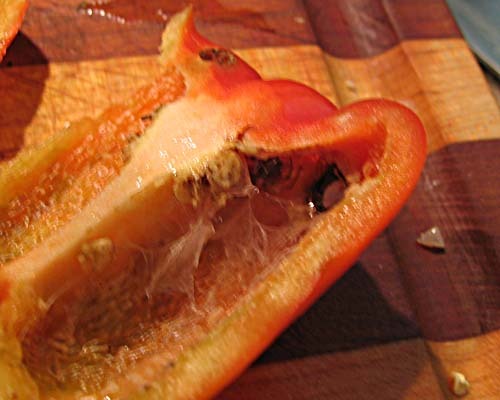 This pepper (including the unharmed arachnid) went into the compost heap after this photo. i think i’m completely off of peppers now. thanks. Very cool in an icky kind of way 😉 Makes me wonder about my yellow, orange and purple peppers and what lies inside of them……..hmmmm..
Home grown or store bought? Home grown. The hole appeared about a week ago on the vine. Sorry! At least I didn’t take pictures of what was growing in the corn in the squirrel feeder that the squirrels ignored all summer for no reason. Corn isn’t supposed to crawl. Aww! I think he (or she, as the case may be) is kinda cute. EEW. and i like spiders. I’m not going to check each tomato from your garden for holes before I bite in. And, yes, I did once get half a worm (from a Blue Berry). The worst experience I’ve had that way was when I bit into something crunchy in a stir-fry dish (green peppers, an entire bunch of cilantro, salted fermented black beans, ginger, garlic, sesame seeds, and soba noodles), something that was not any of the above ingredients. I’m not sure exactly what kind of insect it was, but it was three quarters of an inch long, tasting of bitter orange and hot pepper, and some unidentifiable oily foul essence. It took two days for the taste to leave my mouth entirely. The kids had already eaten a good bit of each of their portions at that point, alas. I pick through cilantro a lot more carefully these days. That cilantro was store-bought, by the way, not from our garden.